Grey is a timeless colour choice. A beautiful dark slate grey wall can instantly add character to a room whilst a pale soft grey finish can introduce a dream like quality to a living space. So why not choose grey for your dressing table? We have a beautiful range of vintage, shabby chic and ornate French style grey painted dressing tables available in a selection of shades and finishes. 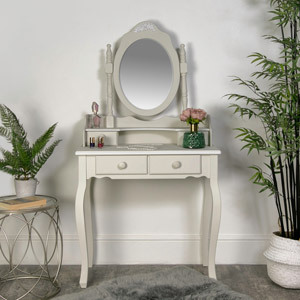 If you are looking for a shabby chic inspired dressing table with glam detailing, you will adore the Elise Grey Range. 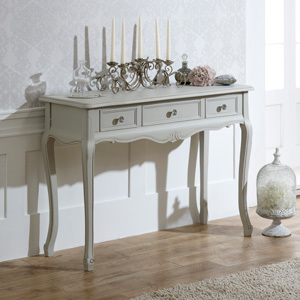 Perhaps you would like your grey dressing table with a darker finish and more antique inspired design? The French Grey Range may be what you’ve been looking for. 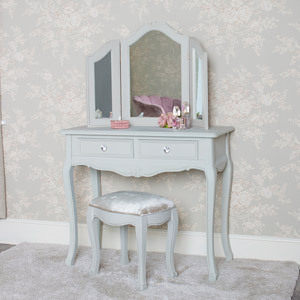 Or maybe you want a classic, vintage style dressing table set with a soft finish? 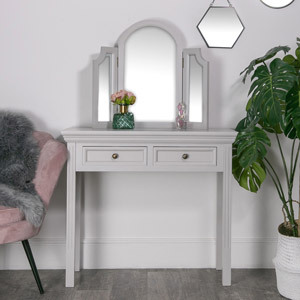 The Albi Range is a grey dressing table dream come true. View our full selection of grey dressing tables and find your favourite.